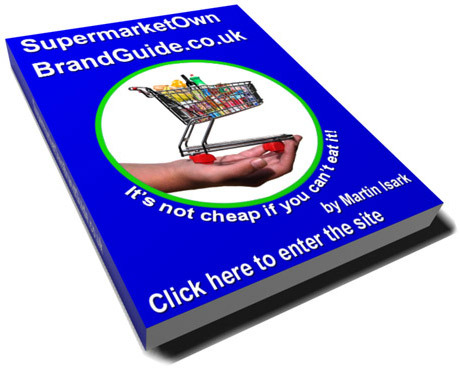 After the interest shown in the book ‘The Supermarket Own Brand Guide’, it seemed an obvious step to create a live web-book, the SupermarketOwnBrandGuide.co.uk, without the book’s restrictions on numbers of pages, products or retailers. Most importantly, the web-book can allow the essential and regular updating of price changes, new or reformulated products and ones that have been de-listed. Just like the book, it provides tasting notes, a score out of ten and health and nutrition information on each product. Additionally, it indicates whether that product is organic, Fairtrade or suitable for vegetarians. Should it contain one of the major fourteen allergenic ingredients: celery, cereals, crustaceans (e.g. lobster & crab), eggs, fish, lupin, milk, molluscs (e.g. mussels & oysters) mustard, nuts, peanuts, sesame seeds, soya and sulphites) that will be displayed alongside the tasting note, under ‘Health.’ Likewise indicated will be the alcohol units. Levels of salt, saturated fat and sugar will be shown only if per hundred grams they stray into the Amber(medium) or Red(high) zone. SupermarketOwnBrandGuide.co.uk does not have a changing panel. I, Martin Isark, am the only professional taster and, if you are unfamiliar with my name or work, please check the link to www.isark.co.uk. For the website, over which I have complete editorial control, to function at the highest level, there must be a professional working relationship with each supermarket and there will be links to their websites and online shopping sites. However, unlike the book, I have given the retailers a choice: if a product tasted scores below four out of ten, they can ask for it to be retasted, then that score will stand. The quality of own branded products is all the time improving to such an extent that hopefully neither of these options will need to be taken up. Currently over 7800 products from Aldi, Asda, The Co-operative Food, Lidl, Marks & Spencer, Morrisons, Sainsbury's, Tesco and Waitrose are listed on SupermarketOwnBrandGuide. Over the next weeks and months surfers will see many more products coming on stream.